I've held off updating my prayer request for The Gambia, waiting for events to settle down a bit, but it seems that I can truly report good news: Former President (dictator) Yahya Jammeh has been persuaded to step down peacefully and make room for newly-elected President Adama Barrow. He appears to have run off with about $12 million of the country's funds, and the questions of his crimes against humanity are left unresolved, but at least The Gambia has been given a chance at freedom and democracy. That's great news! President Barrow and the country are still in much need of prayer. On the financial side, the disappearance of most of the government's treasury may be mitigated by the release of European aid funds that had been frozen because of concerns about Mr. Jammeh's leadership. That's a good thing, because I wasn't sure a Kickstarter campaign could raise 12 million dollars for them—though it would have been interesting to try. Our friend is back from her brief exile, helping the country's best math students get their disrupted educations back on track. One year ago we were five days away from embarking on our Gambian Adventure. (Yes, I'm all too aware that I still have most of that trip to write about.) If our trip were this year instead, we would have had to cancel it. The longtime leader lost a Dec. 1 election to opposition coalition candidate Adama Barrow. Jammeh initially conceded, but later called for a new vote. The United Nations, the United States, the European Union and others have united in criticizing him. Jammeh's party filed a petition to the country's Supreme Court against the election, and a key court ruling is expected Jan. 10. What might follow the court ruling is anybody's guess. Civil war could erupt. Most Gambians are happy with the regime change, but not all. The Gambia's neighbors have not ruled out military intervention if necessary, and even diplomatic and/or economic sanctions could devastate the Gambia's shaky economy. The uncertainty has already disrupted the educations of those who are the country's best hope for progress, and it could get much worse. In recognition of the solidifying crisis, the United States on Saturday advised American citizens not to travel to Gambia "because of the potential for civil unrest and violence in the near future." The U.S. State Department also ordered relatives of diplomats and embassy staff to leave Gambia and warned all its citizens to depart now, saying those who choose to stay should "prepare for the possible deterioration of security." Per these recommendations, the Gambia's Most Awesome Math Professor is away on what she hopes will be a short visit out of the country. 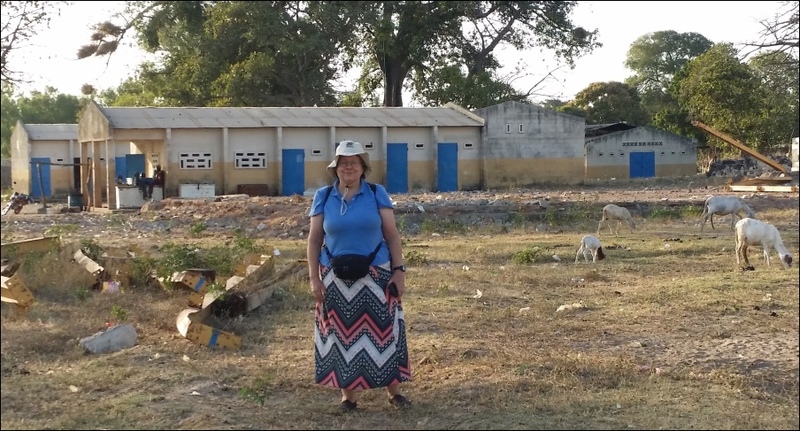 But of course her home, her job, her beloved students, and our new Gambian friends are left behind. Please pray that the transition will be smooth and the disruption short-lived. If all goes well, the new president should take office on January 19, and the Gambia will embark on a new, democratic path of reform. It will be a difficult road—the Gambia is desperately poor and lacking in resources—but a hopeful one. More surprising than Brexit, more shocking than the election of Donald Trump, is the news from the Gambia: President Yahya Jammeh has not only been voted out, but has conceded the election and appears ready for a peaceful transition of power. The unexpected winner is Adama Barrow, whose name makes me smile because I know that he probably has a twin sister. I've not seen that confirmed, but I know from our visit to the Gambia this year that male/female twins are not uncommon there, and are usually named Adama and Hawa (Adam and Eve). Mr. Barrow staged a big political upset in results announced on December 2nd, winning by 45.5% to Mr. Jammeh’s 36.7%. Even more surprisingly—and to his great credit—Mr Jammeh quickly conceded defeat. By the evening, streets that many had feared could be a battleground were full of partying crowds tearing down posters of their outgoing president. Everyone is now running around celebrating. It feels a lot like when the Berlin Wall came down, but without the beer. Everyone is full of hope, but it's a big transition and the Gambia needs all the prayers it can get. Some fear another coup (that's how Mr. Jammeh came to power in the first place), and the country is desperately poor and lacking in natural resources. Mr. Barrow has a difficult road ahead of him. But hope is a great thing. Gambians vote using a system of marbles and metal drums. There's a video in this BBC report that shows how it works. What I like best is that it was filmed in Brikama, where we spent most of our time, and everything looks and sounds so pleasantly familiar. 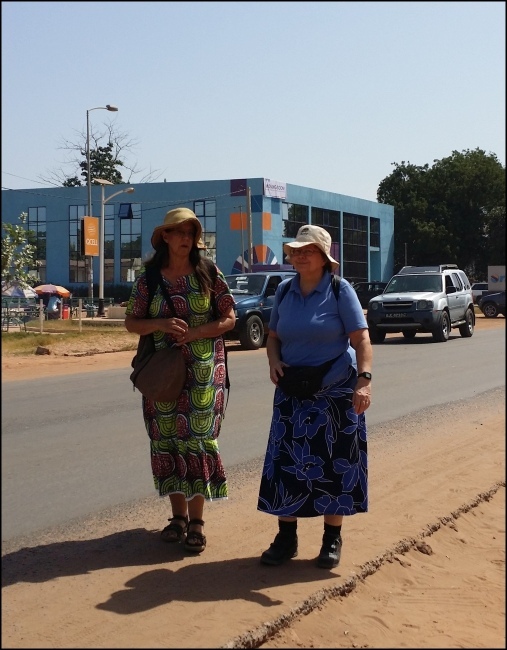 Do you remember Kathy's friend B. who met us at the airport in Banjul? He's also a math major who sometimes comes to her for tutoring. I'm certain that Kathy and I arrived at this plan independently, even though we were both math majors and roommates at the University of Rochester, but it turns out we each sweeten our tutoring sessions with cookies. We even have a particular kind designated as "math cookies"! Having enjoyed Kathy's math cookies when we visited, I thought it would be a good idea to send B. a package of my own math cookies. You know, to see whose work best. :) But apparently our cookies are doomed to avoid that head-to-head contest. I knew it would cost much more than the cookies are worth to mail them to the Gambia. But for years I've been mailing care packages to college students and Hallowe'en candy and other trinkets to our Swiss grandchildren; I don't mind occasionally paying more in postage than the value of the items sent. But the cost to send the wonderful Priority Mail Large Video Box is now $33.95! Sadly, this is still the least expensive way to send cookies, by a considerable margin. And that's not just because it's more expensive to mail something to Africa; the cost to send the box to Switzerland is exactly the same. When I wrote about it in November of 2011, I could use that box to send up to four pounds of goodies overseas for $13.25. This is crazy. What else has gone up over 150% in less than five years? Are you making 150% more than you did in 2011? Does gas cost 150% more? Bread? Houses? Anything? Apparently the IRS is not the only Federal agency to have a grudge against ex-pats. So dear B. will not be getting his cookies, unless I can persuade Kathy to use precious luggage space to bring some home with her next time she visits the U.S. Even dearer grandchildren will also suffer from this USPS outrage, I'm afraid. It's still cheaper to mail packages than to visit in person—but a lot less fun. I'm told it's not a racial slur, but have my doubts. It felt like one. It was certainly a verbal assault. Toubab, toubab, toubab! Give me candy ("minties"), give me pencils, give me money, buy my product, what do you have for me? Everywhere we went we were assaulted by this cry, from children and adults, but especially from the children. I'm told it's much, much worse in the main tourist areas—which we avoided—where hustling is a major adult occupation, but it was saddest to see in the children. Even toddlers came up to us with their hands out, calling "Bab!" Before we left home, we were advised from many sources to bring a supply of items to give to the children. Some recommended candy, others pencils or pens. Well, why not? It's a trivial expense for us, and so joyfully received by the kids. Why not give them a little happiness? Fortunately, Kathy warned us in time to halt that apparently generous impulse. The lesser of the consequences is what it does to white people living in the Gambia. Because begging is so successful with tourists, who are generally white, local whites cannot go about their everyday lives without being bombarded by swarms of pint-sized mendicants. It feels painfully rude to pointedly ignore people, especially children, but it's the best defense. The worst consequence, however, is what the practice does to the Gambians. From the time they learn to walk, these children are being taught that the way to acquire anything is to beg for it. This mendicant culture does not leave them as they grow, though it morphs into a more sophisticated form: the country is completely dependent on foreign aid, NGOs, grants, and donations from overseas. Nor does it help when the donors are no more careful about their gifts than tourists thoughtlessly tossing candy to a crowd of children. While we were there we saw boxes piled on boxes, just sitting in a storeroom—as they had been for over a year—labelled "Books for Africa." No doubt the American donors are content as they imagine happy children poring over their books, and maybe, someday, in "Gambian Maybe Time,"* they will—if the volumes don't rot away in storage first. Bureaucratic nightmares, graft, and outright fraud prevent a lot of well-intentioned assistance from reaching those who need it. Kathy told us of one organization in Germany that persists in pouring money into a local group despite having been shown clear evidence that it is nothing but a scam. Need in the Gambia is great. Unemployment is very high, and long before Syrian refugees made the headlines, young Gambian men were taking the "back door" route to Europe (illegal entry), which many still see as their best hope. But if the Gambia itself is to have hope, they need to shed the mendicant mentality. For now, they do need aid from outside, but if that aid isn't aimed at putting itself out of business, it does more harm than good. Without the wisdom of the serpent, the dove isn't so harmless after all. Despite many serious problems, the Gambia is making progress, and there are places where money can make a big difference. Education, for example, and the simple act of helping a family with their children's school fees. But even that is a painfully slow process with some backward steps along the way. The government has made education a priority, and indeed there are now many more schools available. Unfortunately, the creation of new school buildings vastly outstripped the availability of competent teachers for staffing them. More children than ever are going to school, but without decent teachers, many are simply wasting their childhoods (and their parents' or sponsors' money) sitting in classrooms. That's one reason help with school fees is a good investment; many private schools, though far from all of them of course, still provide a good education. That is why you will often see see Muslim children at Catholic schools, with their families' blessing: since Muslims and Christians generally get along well in the Gambia, parents who value education don't hesitate to take advantage of good schools whenever they can. To return this post to the experience of being the only white folks in a sea of people whose skin has a deep and rich darkness almost never seen among American blacks—it wasn't nearly as surreal as you might think. After all, I don't usually see my own face. It was when I looked at Porter and Kathy that I was startled by the contrast. If it hadn't been for those never-ending cries of "toubab!" I might have been able to forget what I looked like. 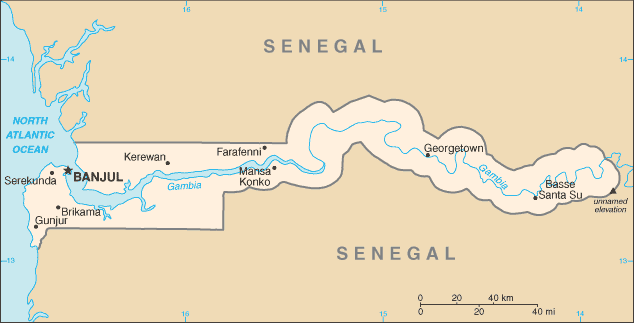 *The Gambia's time zone is Greenwich Mean Time, but the wry observation that GMT stands for "Gambian Maybe Time" is not without basis in fact. Before the wheels of our first flight had left the ground, at least five people had, separately and individually, encouraged me to "enjoy the adventure." This became my motto throughout the trip, helping me glide through moments where I amazed Porter with my relaxed lack-of-panic. I really did enjoy almost every part of the adventure, all the more so looking backwards and knowing that so many things that could have gone wrong, did not. It was all in all an amazing two weeks, and when people ask if we will return, the reason for replying, "not anytime soon" is not due to negative experiences, but that there are so many other places we want to see. I will, however, admit that the largest factor in making the trip both awesome and not scary was having a friend on the ground (Kathy, with several years of local experience) and a caring, competent guide/guardian angel (Kathy's student and friend, B). From New Zealand to Japan, Switzerland, France, and now the Gambia, my taste in overseas travel has always favored the local over the standard tourist experience. Thursday, January 14 - Friday, January 15 Our first day of travel was actually our first two. We left Orlando at a comfortable time, shortly after noon, and arrived in Banjul around six the next evening. Porter had done a lot of research into flights from here to the Gambia, including options that had us going via Tenerife and Casablanca. That would have been interesting, but I'm glad we ended up with a much shorter trip on an airline less renowned for losing luggage. First stop: Newark. We've flown through Newark a lot, but United's international gate area was something new indeed, and made for a very pleasant wait. Every airport I've flown out of has some sort of seating at the gate. 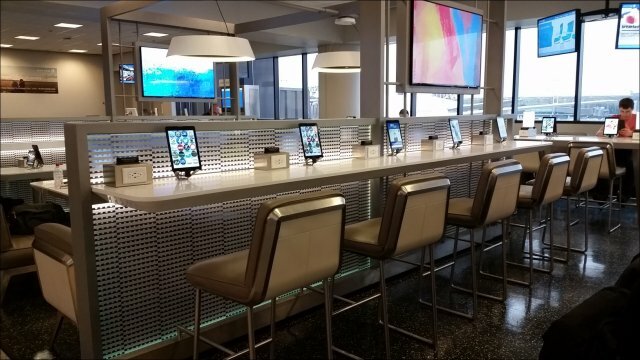 Good airports have electrical outlets available, but never enough. Many times I've seen pleasant seats going unused at a crowded gate, while weary travellers sat awkwardly on the floor next to the few existing electrical outlets, all of which were positioned to favor the cleaning crews' vacuums over travellers' electronic devices. The better airports have charging stations, or power outlets available in some seats, but again, never enough. United Airlines in Newark had enough. In addition to power outlets and desk space, each station was equipped with a tablet from which one could use the Internet, play games, shop at various airport stores, and order food. I call that a great idea, though I didn't sit down for long. I left Porter at work at our desk, watching over my charging phone, while I did laps around the gate area, logging my customary 10,000 steps for the day. I would accomplish that goal only three more times before returning home. Contrary to all my expectations, we sat a great deal more than we walked in the Gambia. Travelling long distances with small children is challenging at best, and when the airline has lost your stroller and the Customs officials are being particularly nasty it can be a nightmare. Travelling alone means there is no one to watch your belongings when you want to duck into the restroom or pick up a bite to eat along the way. 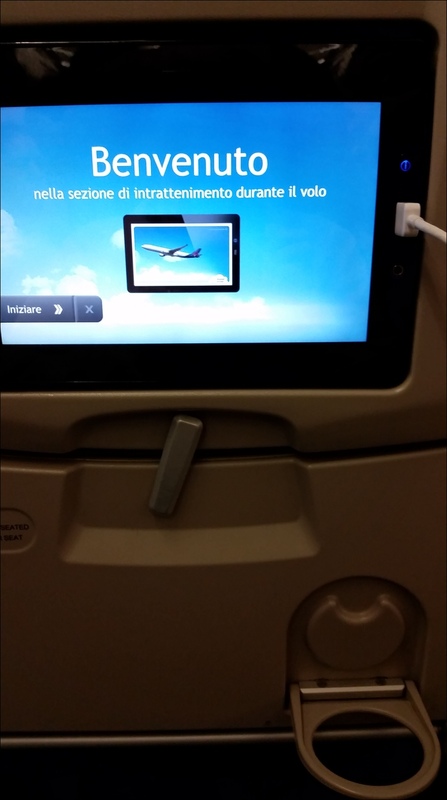 (The fancy new setup at the airport gates can take care of the latter problem, but not the former.) But long flights with several stops can be enjoyable and even restful if you're travelling with a pleasant, adult companion and plenty of entertainment in the form of Kindle books and World of Puzzles magazines. Time changes have also become a lot easier to deal with since I've learned to sleep on the plane when I'm tired and not pay attention to the clock when I'm not. (It also helps to arrive at one's destination in the evening rather than in the morning.) All that to say, as long as the flights are more or less punctual and I have plenty of time to make connections, I enjoy air travel. On this trip I added three new countries to my collection in a single day. By the time we landed in Brussels it was Friday. (Technically, I didn't actually enter Belgium until our return trip, as we didn't have to go through Passport Control to catch our next flight.) 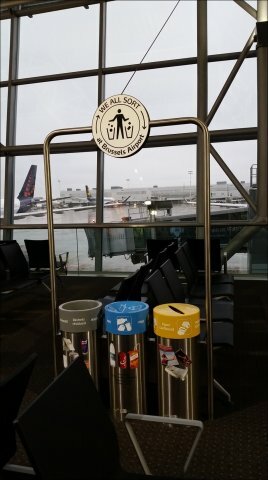 This cute recycling station is the only photo worth sharing I have from our stay in Belgium. Our Brussels Airlines flight to Senegal, however, provided this example of an intelligent seat console, complete with cup holder and USB charging port. As usual, there wasn't much attractive to me in the entertainment offerings, but I did enjoy watching The Martian for the second time. It was especially enjoyable having read the book since my first viewing of the film. Porter also took the opportunity to watch Bridge of Spies, which he thought was great. 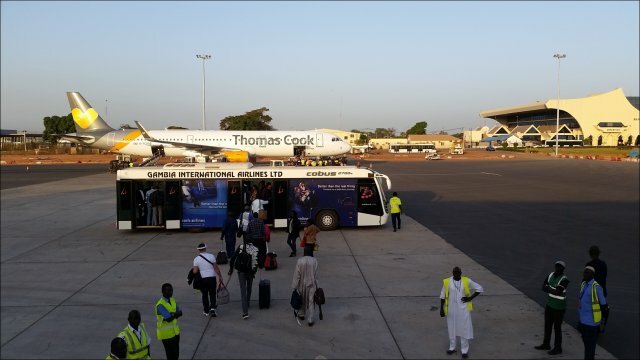 We didn't officially enter Senegal on this day, either, as we did not change planes. We waited there for over an hour, however, and I was allowed to get to the very edge of the door to snap this photo. 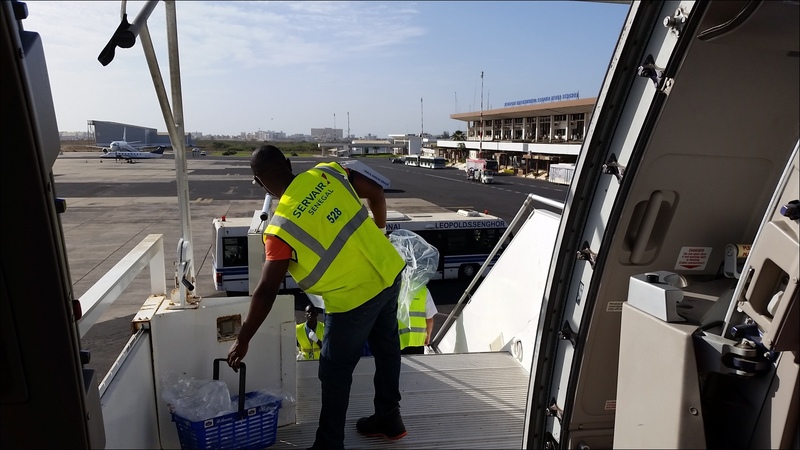 The flight from Dakar to Banjul is short; we probably spent less time in the air than we did getting out of the airport once we landed. Our first impression of the Gambia was not the most pleasant: long waits, and people pushing and shoving and hustling. What must the Swiss think? The Swiss know how to wait a few steps back from the luggage carousel, so that everyone can see, approaching the belt only when it's time to pick up their own bags. This was also the only time our luggage has been x-rayed on the way out of the airport. We were glad to be able to tell the hustlers that we had no money; Kathy had dalasis for us, but she was out of reach on the other side of the border controls. At least we certainly hoped so, though she was out of sight as well. We learned later that the hustlers would have been happy to take our dollars, but we weren't inclined to want help with our luggage, anyway. Finally we made it through, and there was Kathy—and how great it was to see her again! And to meet B., whom we knew only by name and voice: he had recorded the numbers from 1 to 100 in the Mandinka language for our number-and-language loving grandson, Joseph. Apparently B. felt the connection, too, as one of the first things he asked us was to tell him more about Joseph. B. had arranged a car to transport us all to Brikama, where Kathy lives. The trip began a bit inauspiciously, as in order to start the engine the driver resorted to a trick I remember seeing as a young child: getting several men—including Porter—to push the car to a certain speed, then popping the car into gear. After a couple of tries, it worked, and we were on our way. Google says it's a 20-minute ride. There's a lot Google doesn't know. The car started giving trouble. It stalled. They were able to get it started again, by the same method. It stalled again. The driver decided something serious was wrong, and put into effect the Gambian equivalent of calling AAA: he hitched a ride back to the town we had just passed through and found someone else with a car, who took us to our destination and then returned to help out the first driver. It was while we were waiting for the second car—in the rapidly-falling darkness of a land near the equator, on an isolated stretch of the highway with no street lights, in a completely foreign third-world country—that Porter wondered why I was so calm. Well, why not? Kathy wasn't upset, B. wasn't upset, and the driver was only upset with the person who had borrowed his car and apparently treated it badly. If the people who knew the country found nothing of special concern in the situation, well then, it was just part of "living the adventure." Finally, we arrived at Kathy's place. We were more exhausted than hungry, but B. 's mother had send us dinner, and he joined us for the meal. We weren't too tired to enjoy both our first Gambian meal and the conversation. But thus it came about that practically the first thing we did upon arrival in the Gambia was to break the rules our doctor—and all the travel advice sites, including the CDC's—gave us about what not to eat there: Be sure to avoid everything—except for fruit that you peel with your own hands—that has not been thoroughly cooked. It was a problem that we would face throughout the trip: how to balance our health and safety concerns with the need to be courteous to our hosts. We felt that in this case the choice was clear, so we dug right in to a dish that included fresh tomatoes and lettuce. It was just another part of the adventure. And although we didn't know for sure until the next day, I'll close by revealing the punch line. There was evening, and there was morning: the first day. And it was very good. I've been overseas every year for the past decade, so it ought to be routine by now. But travelling to the Gambia is not like travelling to Japan or to Switzerland. For starters, we needed visas. Most visitors to the Gambia don't need visas, but the United States is special. American tourists are required to fill out a bunch of paperwork and fork over $100 (each). Because we have family overseas, we are always a bit nervous when our passports are out of our hands, but the process went smoothly and we had them back, with the necessary visas, in just a few days. Then there was the medical side. 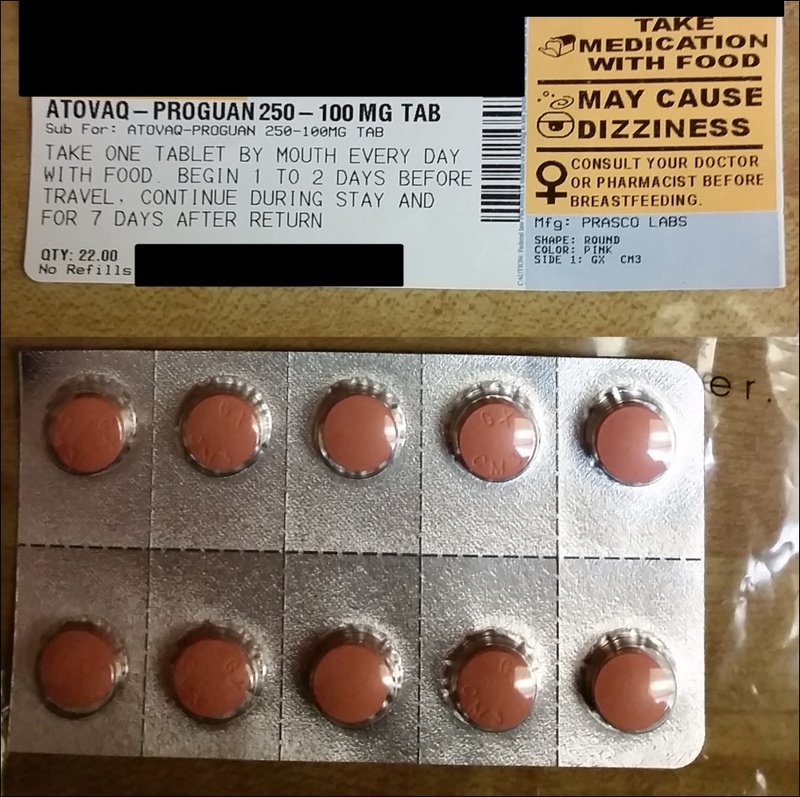 Immunizations (yellow fever, typhoid, meningococcal, hepatitis A & B) and medications (malarone to be taken daily as an anti-malarial, Cipro in case of traveller's diarrhea, probiotics in case we had to use the Cipro) cost us some $1200. We were spared the rabies vaccine, although if the doctor had known how many stray dogs we were to encounter, the story might have been different. Our insurance company believes in funding preventive medicine, they say, but clearly their idea of tropical disease prevention is encouraging people to stay home. And finally, the new wardrobe. As nearly all of you know, I'm not a shopper, I don't care anything about clothes as long as they are comfortable, and the occasions for which I will put on a dress or a skirt are so rare as to be barely perceptible. (Weddings of family members. That's about it.) But then Kathy happened to mention—fortunately, in time for us to do something about the problem—that I'd need to wear a skirt or dress (mid-calf or longer) whenever we went out in public, and even at home if we had visitors. I suppose most women would have just packed a few dresses and been fine. I needed to go shopping (oh, joy) and climb over a major psychological barrier. Dresses, after all, are the tools and symbols of oppression. Oppression of women by men, of children by parents, of students by teachers. Unless you happen to be the queen, or to live in Scotland, skirts are not associated with power. While I might not be as sensitive as some in my family to shirt tags and wrinkles in my socks, it's still an issue for me, and I still remember, and not happily, the time when as a very young child I was required to wear a certain dress—beautiful, and hand-made with lots of love, but very scratchy—for an interminable period. Really, it was just long enough to go to the photographer's for a professional picture, but it was torture to me. I'm grateful that most of the time my mother was more merciful when it came to my clothes, but dresses = discomfort was ingrained in me from an early age. And then there was school. As if school weren't oppressive enough all by itself, in those days all girls were required to wear dresses or skirts and blouses. Even on the playground, even in gym class. Girl Scout uniforms were dresses. Church clothes were dresses. Believe me, if it had been possible for me to get used to wearing skirts, I had plenty of opportunity to do so. It didn't happen. On top of that, dresses in those days were not loose and flowy, but short and tight. It was the era of the miniskirt; even for the more conservative among us hemlines had to be above the knee, greatly limiting movement and action. A dress was a prison. But the times, they were a-changin.' When I went off to college I left my dresses behind me, and after graduation being a computer programmer allowed me to land a job without much in the way of a dress code. I'm not certain, but I think the next time I wore a skirt was at the rehearsal dinner before our wedding. My sister-in-law made an odd but brilliant suggestion, in the form of mid-thigh underwear from the Vermont Country Store. I was skeptical, and indeed they did not suit me as underwear. But as something to wear under my skirt and over my usual underwear, they were perfect for the Gambian weather situation: temperatures in the 90's and no air conditioning. The over-underwear did a wonderful job of absorbing the sweat that otherwise poured uncomfortably down my legs. (As a Floridian, I'm accustomed to hot weather, but deal with it by  wearing shorts, and  relying on air conditioning.) There's also no overestimating the psychological value: they felt like shorts on my body, which helped undo some of the mental discomfort. I had one other trick up my sleeve as well: When I caught myself feeling overpowered and bowed down because I was wearing a skirt, I imagined being a Scottish chieftain, and that actually worked—even though my skirt could hardly have looked less like a kilt. We were out in public a lot. As Kathy explained, the Gambia is a hard place to be an introvert. Although I would usually rip my skirt off in favor of shorts as soon as we walked in the door of her house—in order to cool down a little—for most of our two weeks in the Gambia, I lived in a skirt. And we developed an uneasy friendship, the skirts and I. After returning home, I washed them and put them away in the back of our closet, so glad, as they say, to see the back of them. But one day, after sufficient time has passed, I will pull them out again and wear them for some occasion, perhaps a party. I'm glad to have them in my arsenal of clothing. Being loose, long, and of soft material they are a far cry from the dresses of my childhood. Besides, they are full of wonderful memories! As for the rest of our trip preparations, I suppose they were mostly normal. We had our tickets, our visas, our "yellow cards" showing yellow fever immunizations, our anti-malarial meds, the proper clothing, and a few gifts. It was time to begin the adventure! I know people who are fond of saying, as if it were original with them and somehow encouraging to others, that we should never ask for what we deserve, because what we all deserve is Hell. As unhelpful as this aphorism is, there are times when everyday life points to a kernel of truth there. We remember vividly the times when we've done something stupid and paid the price, or done something stupid and managed somehow to escape disaster, but we may not even be aware of how many, many times we've been equally stupid, or more so, and escaped scot free. How often have we taken a foolish chance while driving, or set a can of soda near the computer, or carried a large stack of breakable objects? How many times have we thought, "I knew that was going to happen" when a foolish risk has ended badly? Truly, when we know what we should do and act otherwise, do we deserve to escape the consequences? No—but surprising often, grace abounds anyway. It's an old, sad story, and out of respect for those who, like me, are not fond of suspense, I'll say up front that this one has a happy ending. I'm usually a bit compulsive when it comes to doing backups. I have general backups, and specific backups. Whole and incremental backups. Backups divided over several years and different external drives. But I'm not perfect about it, and this was one of those times. Mostly I find a once-a-week backup sufficient for my needs, but recently I've been working pedal-to-the-metal on processing our photos and videos from the Gambia, so I got into the habit of backing up my work every night. See, I know the right thing to do! But one night the backup system gave me trouble. Instead of spending the next day sorting it out, I carried on feverishly with my work. I was making such good progress! Who could be bothered with a problem that was, I knew, going to be frustrating and time-consuming to sort out? So for a few days—highly productive days—that nightly backup didn't happen. I'm a big fan of the recycle bin. I love that a deleted file doesn't really disappear right away, so that accidents and mistakes are reversible. However, some files, such as video files, are too big for such treatment. For those I use the shift-delete function, which bypasses the recycle bin and erases the file directly. One morning I was working with a number of video files, and got a little too careless with my quick response to the "Are you sure you want to permanently delete this file?" question. 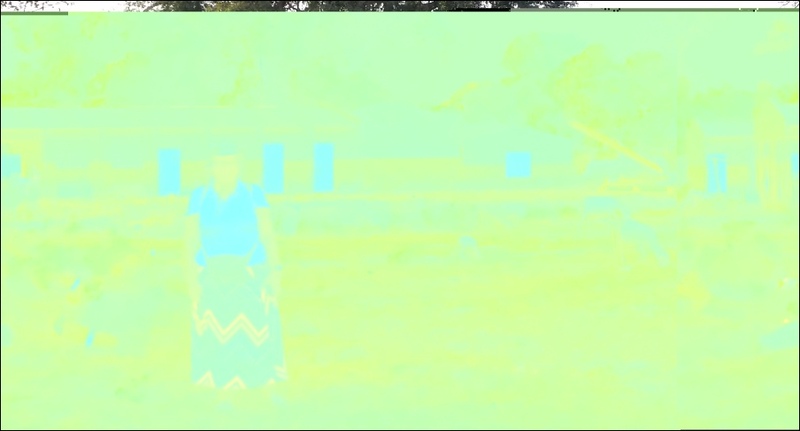 I was certain I had highlighted the video I was done with, but Windows Explorer had other ideas. You want to delete the entire directory? The entire directory with your final processed photos? The directory that represents 60+ hours' worth of work? Fine, no problem, I can do that for you in under a second. I stared at the computer. I didn't believe what appeared to have happened. I turned my computer inside out, searched from top to bottom. Finally I let myself admit that the files were gone. Completely. Gone. I was surprisingly calm. Sometimes big events leave you too overwhelmed to be upset. Besides, I did have some backups, though they were, as I said, a few days old, and the most recent one had been corrupted by the above-mentioned problem. But as I also said, I'm usually compulsive about backups, and if I didn't have my work in final form, I did have it in next-to-final form, and the form before that, and the form before that. What had been done once could be done again, and though the magnitude of effort lost was mind-boggling, I took comfort in a comment reader-friend Eric once made here about work being done better the second time around. As it turned out, we'll never know how much better I would have done the second time, and that's more than fine with me. When files are deleted from a drive, even by shift-delete, they're not really erased. They're no longer visible to the user, but the data's there until it's overwritten. I knew that, but had no idea how to take advantage of it. Then a little Internet research led me to a data-recovery program called Recuva. Had my files been on the C drive, I may have been in trouble, because I did quite a bit of work before finding that program, and the more time that elapses, the more likely the data is to be overwritten. But because of space considerations, my data was on an external drive that I had been careful not to write to since the loss. The operating system, or some other program not under my control, probably did something, but—to shorten the story—with the help of Recuva I was able to recover all but about half a dozen files. The few that had been damaged I easily recreated from the next-to-final layer. I'm very grateful I did not accidentally delete a higher-level directory! Once I had the program downloaded and unzipped to a flash drive, using Recuva to restore the files was quick and easy. The long and tedious part of the job came in checking the integrity of the recovered files, but that only took five or six hours, and by the next day I was back to where I'd been 24 hours earlier. With one important exception: I now have Recuva on that flash drive, available should I need it again. It's especially important to have it handy in case I ever need to recover files from the C drive, where overwriting can happen quickly. Which I sincerely hope never happens! It's amazing how easy it is to accept the loss of a day's work—which normally would have had me tearing my hair—when faced with the realization that the loss could have been many times greater. I'm sorting through the photos from our Gambia trip. During our safari in the Fathala Game Reserve in Senegal, I hastily wrote down the names of the animals so that I could properly identify the pictures. That is, I wrote down what I thought I heard our guide say. Her English was excellent but heavily-accented, and I knew that what I heard could not possibly be right. But I wrote it as I heard it, counting on the Internet to help me after we returned home. "yellowbill asparagus" = yellow-billed oxpecker. I knew it couldn't be "asparagus," but that was the closest I could come. The patas monkey (Erythrocebus patas) ... is a ground-dwelling monkey distributed over semi-arid areas of West Africa, and into East Africa. It is the only species classified in the genus Erythrocebus. Recent phylogenetic evidence indicates that it is the closest relative of the vervet monkey (Chlorocebus aethiops), suggesting nomenclatural revision. So I'm sticking with the name our African guides gave it. "nests vled vivas yellow female" = some sort of weaver birds' nests, possibly village weaver, possibly Vieillot's weaver. This was a tough one, from our Janjanbureh trip. Fortunately, birding in the Gambia is a popular tourist activity, so that helped. Which particular weaver "vled" is supposed to represent, I can't guess. 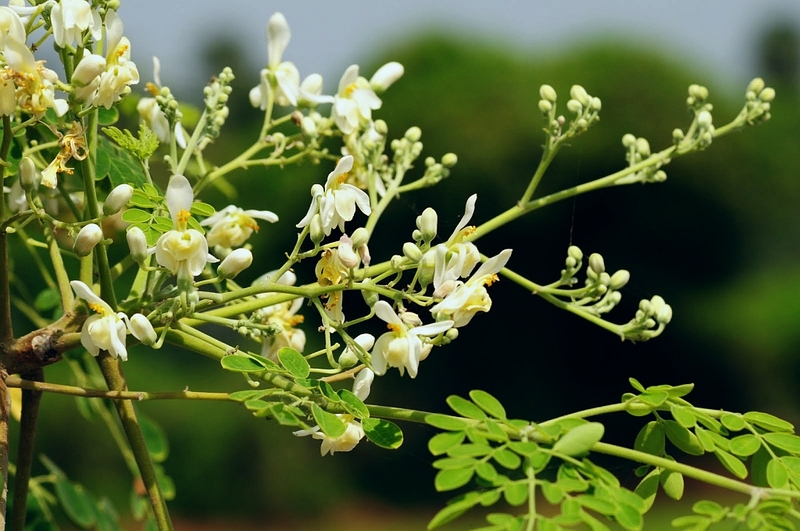 "never die plant heal wound kill snake" = moringa plant. This was tougher than it should have been, because where I saw it, the plant had other plants growing with it, and its own leaves had been mostly stripped off. But finally I'm convinced that this is it, despite there being no mention online to confirm our host's contention that it kills, or even repels, snakes. The rest I actually heard correctly, though I didn't write down as much as I would have liked to. "Write down" meant changing the file name of the camera image to include the label, not the easiest of ways to take notes, but it's what I had. 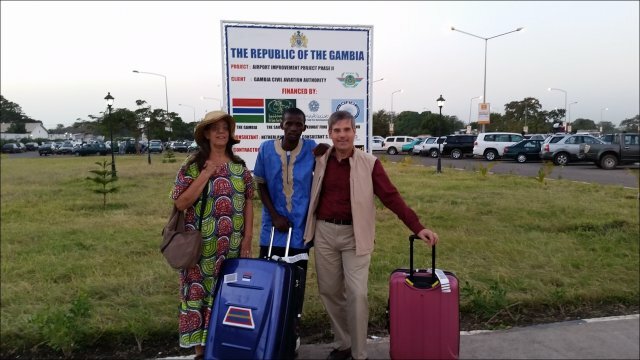 To the Gambia and Beyond! Many of you know that we recently returned from a two-week trip to the Gambia, that tiny country within Senegal in West Africa. Since I never fully appreciate an experience until I've written about it, I've started a new category here, in which I'll put both travel memories and Gambia-inspired musings. Expect it to be rather random; if I wait to get it all organized I'll have forgotten too much. (Lots of thinking to do, many activities, and over 1600 photos.) In the meantime, here's some background. After a couple of false starts some 45 years ago, I finally found a college roommate who became a friend for life. (Realize that in those dark ages, even smokers and non-smokers were often paired up to live together!) Kathy went on to get a Ph.D. in mathematics and enjoy a long career as a university professor with a well-deserved reputation as an excellent and caring teacher. Several years ago she embarked on a different sort of adventure altogether, and is now a math professor (and department chair) at the University of the Gambia, with an even stronger reputation for both excellence and caring. She's not there for the adventure (although there is plenty of that), nor for the salary (meagre), and certainly not for the working conditions, but to make a difference in the world. Yes, she's a saint, a fact of which I'm all the more convinced since our visit. (You can ignore this part, Kathy, assuming your flaky Internet connection lets you see it. You and I both know you're still the crazy person I knew back in college.) Perhaps it's more useful—since labelling people as saints tends to put them out of reach—to say that she's a Christian called by God to use her skills and experience in an unusual place. However you look at it, she's there, and is making a difference. The world, Africa, the Gambia, even the University—these are too large to exhibit visible change. But without a doubt she has for a number of years been changing the lives of families and individuals for the better. However, despite the University's state of denial, she won't be in the Gambia forever. Hence our determination to seize the year (and the presence of this trip on my 95 by 65 list). The only reasonable time to make the trip was in January, which is during the dry season and between semesters for Kathy. Coming during the dry season turns out to be very, very important: the weather, though still hot (90's) is much more pleasant, the mosquitos are much less numerous, and transportation tends to be through a few inches of dust instead of a foot or more of garbage-and-water. Definitely the time to go! Some people travel for adventure. 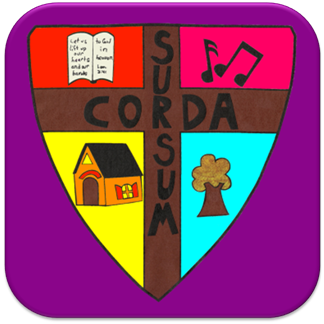 Others for the educational and cultural growth. As much as I value the latter, the primary importance of travel for me is still being with family and friends—and specifically, seeing them in their native habitat, as it were, so that their stories and experiences have more meaning when I hear them from far away. The educational experiences are a great bonus thrown in, and on this trip we even had a few adventures. I had a 325-day streak going on my DuoLingo language lessons. I managed to maintain it through our long plane flight to the Gambia, and through the first couple of days there, even though Internet was spotty and difficult. But then we went on a five-day trip up-country where there was No. Internet. At. All. Nada. DuoLingo allows you to "buy" (with credits) a "streak freeze" by which you can suspend your streak and restart. That's the theory, anyway. However, you can only buy such an extension one day at a time, so even though I have so many credits I could suspend for 137 days, that did me no good at all when I couldn't access the Internet for several days in a row. I'm okay with all this, though I wish DuoLingo had a more useful "suspend" function. Streaks can be motivating, and the daily reminders certainly helped me establish a good habit. But while striving to keep up a streak can be a good servant, it's a bad master, and I threw it away without a second thought in favor of an invaluable experience. My walking/running habit suffered a similar setback this trip. Travel is great, but very hard on carefully, painstakingly built habits. I gave myself four days of recovery once we returned, and there is still much that needs to be done before I can say we're settled back in. But today is the deadline I've given myself for restarting my DuoLingo, exercise, and some other formerly-regular habits. 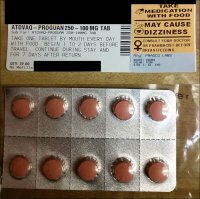 It's a small step, but if I succeed, it will be the soonest I've ever recovered from a trip. The burden of important projects that have been neglected since before Thanksgiving (many of them for much longer than that) is likewise weighing heavily on me. Travel is fun, and more importantly travel is valuable—ten times more so when it means spending time with family and friends. But if I'm going to continue to enjoy it, I need to be more deliberate in budgeting for project time when we are home. Plus, for me, the larger part of the travel iceberg lies below the surface: the processing and writing time. Not to mention over 1600 photos to sort, evaluate, and organize. 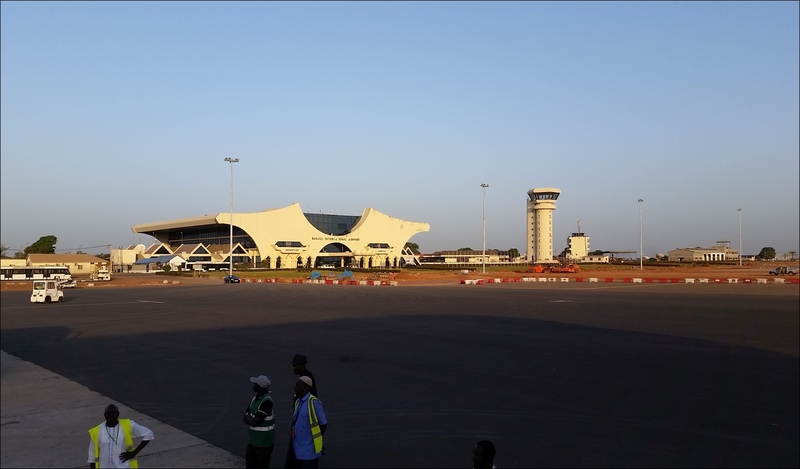 On January 28, 2016, we were preparing to land at the end of our flight across the Atlantic from Paris to Newark, the penultimate leg of a journey home from the Gambia that had begun with a take-off from the emergency Space Shuttle landing site that serves as the Banjul Airport runway. Thirty years ago, that same Atlantic received the shredded remains of the Challenger and all her crew. What Reagan (and Noonan) knew, as did Winston Churchill, was how to inspire people to be better than themselves. You don't make children learn more by telling them how stupid they are; you don't make people love others better by insisting they are racist, sexist pigs; you don't encourage the weak to become strong by pointing out their failures. Nor do you regale them with how strong and smart they are, and insist "you can be anything you want to be." You don't imply that success should be easy or that love doesn't require sacrifice. You don't suggest that the best way to fight terrorism is to continue buying and selling as usual (President Bush after 9/11) or partying on (some Parisians after the recent attacks). A good leader is not afraid to insist that there is no gain without risk, no success without effort, and no victory without battle. The way is hard, the road is long, and it is not safe. A great leader goes on to encourage others to believe that they are the kind of people who will rise to meet the challenges; that the benefits will be worth the cost; and that the way, though difficult, will be sprinkled with joy.